I couldn’t tell you the amount of school closures that take place around this time of the year. Just before classes begin in August, the local school board announces the closure of one of its prominent schools. Lack of funding and enrollment numbers are often the prominent factors behind the cease of a school’s operations. What it is interesting about these closures is that I never hear much displeasure from the community. No protests, fundraisers or even special elections geared to the funding of these public schools. I believe this is due to the phenomenon surrounding the management of education in the 21st century. As public schools grapple with severe budget cuts to programs, they also face enormous pressure to transfer tax dollars to targets outside traditional public education. New policy mandates at the federal and state levels are forcing public school systems to redirect tax dollars meant for public schools to various privately held concerns such as charter schools, private and religious schools, and contractors and companies tasked with setting up new systems for testing and accountability. With more students enrolling in private schools or being home-schooled, public education is finding difficulty in staying relevant or an optimal choice for the 21st century student. What this now forces educators and administrators to think about is how to develop newer curriculum models and choices within the public system in order for public education to stay as a primary choice for children. There is no longer a conventional way to think about public education in this country because there is no universal delivery system. Students learn in different ways, which forces teachers to employ different styles of learning. Students can be advent learners through visual examples or through theoretical components. Curriculum models should focus on applying both practical and theoretical concepts to learning for students, specifically teachers can use practical knowledge in combination with the theoretical concepts in their subject matter. There is a longstanding disconnect between the national and local levels with regards to public education. The debate on the national level generally draws on evidence from macro-sources of data such as standardized test scores, reports on the nation’s dropout rates, samplings from various student populations and comparative assessments in various subject areas. However, people get their school news from far more local, personal and qualitative sources — from hometown newspapers, from local television and radio broadcasts, from neighbors and their own personal observations and experiences. According to the Education in Crisis website, specifically in the K-12 space, the federal “Race to the Top” initiative has enabled a growing level of privatization in the K-12 segment, rewarding districts for embracing alternative models, technological advances and locally based criteria. The Obama administration’s “Race to the Top” programme – which has pledged a total $4.35 billion to advance education reform and innovation in American schools – is directly and openly linked to the advancement of the educational marketplace, including various forms of education privatization. To help further this cause, technology is being adapted and applied to many schools across the country. The best example of this is in Miami-Dade County in Florida. National security intelligence studies, forensic sciences & law enforcement. Engineering, robotics and legal studies. Computer science, culinary arts and performing arts. According to WSVN.com, several new initiatives have also been included to help better the learning experience for students. Some additions include offering 32,000 tablets to all eighth grade U.S. history classrooms and all 10th grade students enrolled in ELA; Wi-Fi hotspots on district-owned school busses; and a GPS system on buses to give parents and students the ability to track the buses whereabouts. 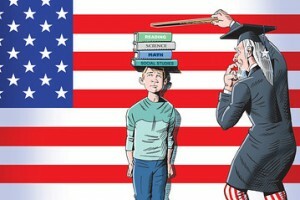 If we need to preserve public education in this country, we must rethink how it is administered to our children. Miami-Dade County is on the right path and I believe with the use of technology we will correct the issues of education in the public sector and eliminate the disconnect between the national and local levels. Public education remains a merit good that must be preserved at all available cost to promote liberty and socially inclusive societies. This is especially important in low-income countries where affordability of fees charged by private schools is weak and dwindling due to the current economic downturns in most of these states. Thank you for the thoughtful article. Primary and secondary education should be a priority concern of ASPA. In 1989 I was one of two Board members of the National Capital Area Chapter (with Kathy Newcomer of GWU) to help establish the first career academy in Washington, DC — the Public Service Academy. As a member of the National Council, I got created and chaired a task force on secondary education, which led to creation of public service academies by some ASPA chapters, a successful but short term endeavor. I have been involved with career academies in the DC public school system ever since. In the course of which, I have become a student of school reform. I would enjoy discussing it with you.